Aloha! Please use the subject heading “Class Inquiry” if you need to email us. The amount of Spam and scam emails have become so intense that I am unable to scroll through the trash emails. Mahalo! We are back with a full line-up of classes running through June 2018. Find your class and date on the registration page. Book your class online to reserve your seat. Register here. I am very pleased to announce that Hawaii School of Photography will be at the second Hawaii PhotoCon Tradeshow September 7-9, 2018 (http://photoconhawaii.com/) Don’t miss this incredible convention that runs from October 4th through the 8th! Stop by our booth with ANY photography questions and bring your work for a free critique (if you want!) or just come talk story! The cameras in personal phones have all but replaced point and shoot cameras. Similarly, editing your images has become an important part of the creative process. 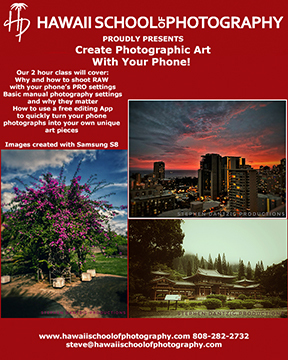 Our 2-HOUR Create Photographic Art with Your Phone class is a short but intense introduction to photography and editing with the one camera that you will almost always have with you: your phone! 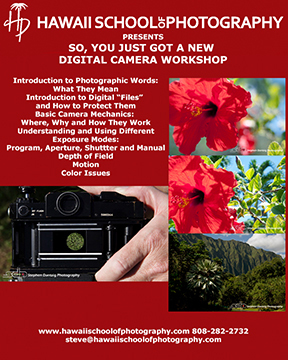 Mahalo for your interest in our “New Digital Camera” Class. Are you wondering how to work your Digital camera? We host a three to three and 1/2 hour overview where you will learn how to find the key controls on your camera and what they do for you. Do you want a more in-depth introductory class? 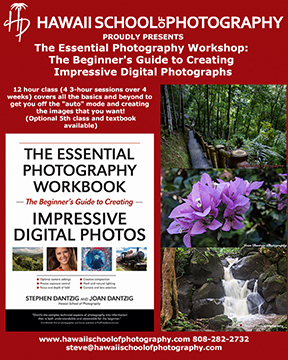 The 12 to 15-hour Essential Introduction to Digital Photography class is an intense program. The date listed on the calendar is day one of four consecutive Mondays. This 4-day 12-will take you from the “nasty green Auto” mode to understanding how and why to fully control your exposure settings in Manual Mode. We cover f-stops in detail, shutter speeds, ISO and how the three relate to each other. We talk about how to use your meter and cover motion as well as depth of field issues. Color concerns, lenses, perspective, and composition guidelines are also covered in detail. We go over issues relevant to protecting and understanding your digital files. Homework assignments allow you to practice what you have learned in class. We have a new textbook out that reinforces the lessons from this class, including more detailed assignments and a lot more! There is an optional 5th day available for additional tuition. 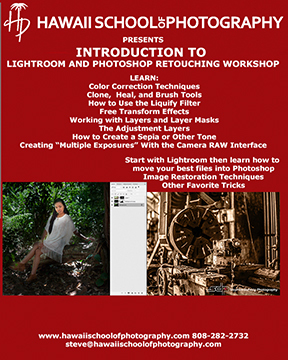 The 4-hour Introduction to Lightroom and Photoshop class is a jammed packed workshop that will teach you how to navigate around the overwhelming Photoshop interface. You will learn the critical tools and filters for basic retouching and work with layer masks and adjustment layers. NOTE: This class is extremely small–Only 2 students per class. This class is held in my office (also my living room) in Waikiki so I can show you the tools and techniques on my larger desktop computer while you follow along on your laptop. Parking, is, unfortunately, “Waikiki ‘catch-as-catch-can. '” This class is NOT held downtown! Discover Oahu that is “Off the Beaten Track” and learn ways to better capture her beauty with the assistance of Hawaii’s premier photography educators. We will meet in a beautiful botanical garden with breathtaking views of the majestic Koolau Mountain Range. We’ll start with pointers on how to create beautiful images regardless of your equipment or experience level. Your expert tour guides will be on hand at the park to offer suggestions and answer all of your questions. 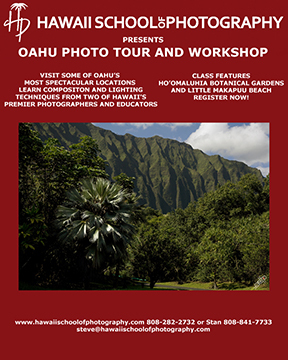 We will then proceed to one of Oahu’s beautiful beaches where you will receive further coaching on how to create stunning scenic photographs. The intermediate seminar is geared to the photographer who has a working understanding of camera mechanics and knows how to manipulate f-stops and shutter speeds, but wants to learn more about light and how to control it better. This 4-hour INTENSE seminar will review and enhance your understanding of the basics of photography and take you into the realm of understanding what light is and how it works! Learn the basics of studio photography and apply your new knowledge with a same-day 3-hour shoot with one of O’ahu’s top models! 8-9 hour workshop. 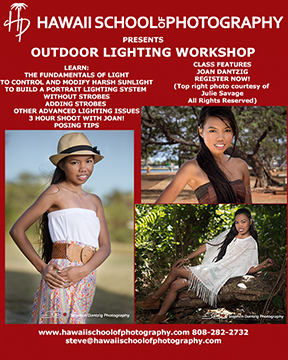 Taking it to the streets: This 8-9 hour seminar that emphasizes outdoor lighting and photographing models outdoors. Seminar includes a 3-hour shoot with one of Oahu’s top models. 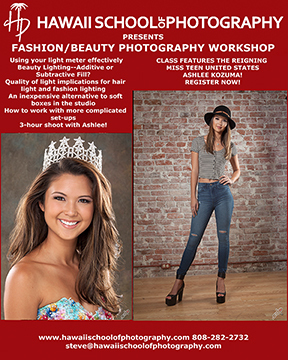 Move beyond the basics of studio lighting and explore Beauty and Fashion Lighting, two very popular genres of model photography in this 8-9 hour workshop that includes a 3-hour shoot with one of Oahu’s top models. 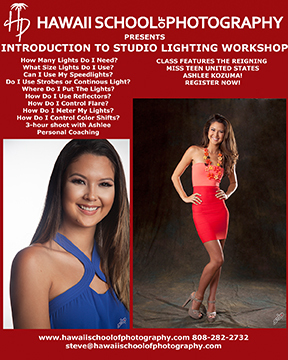 Learn how to combine different sized lights to create beautiful Glamour images from a commercial as well as personal viewpoint in this 8-9 hour workshop that includes a 3-hour shoot with one of Oahu’s top models. Hawai’i is synonymous with the idea of beautiful beaches—and swimwear! 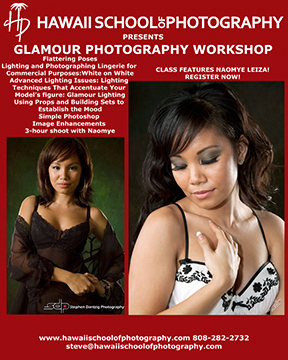 Learn the fundamentals of lighting and posing to create amazing swimsuit fashion photographs in this 8-9 hour workshop that includes a 3-hour shoot with one of Oahu’s top models. 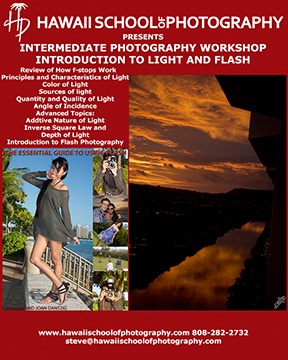 List and short description of Hawaii School of Photography's classes and workshops.